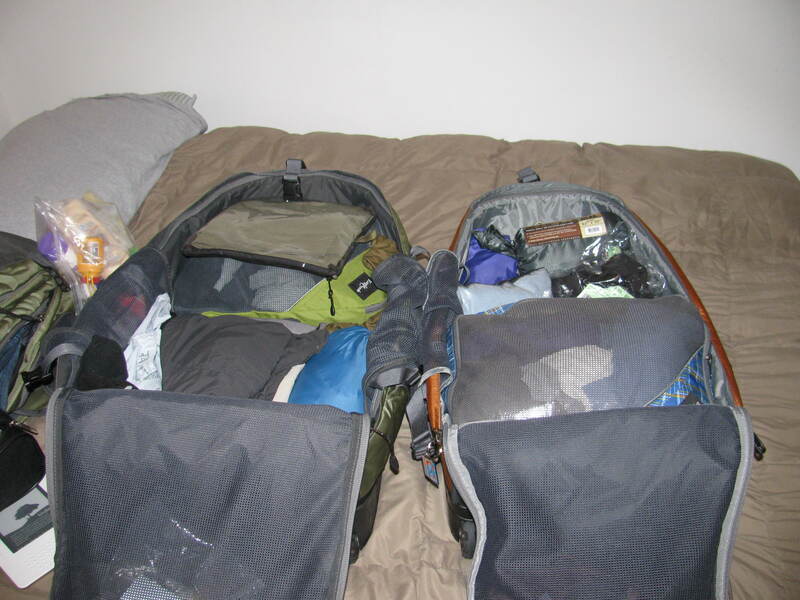 I have been traveling light for years – Tim actually has more trouble with this then me, and claims his clothes are just so much bigger than mine (but that doesn’t explain why his toiletry bag is bigger). The thing that people also forget is that unless you’re going to Antarctica you can get most things wherever you’re going, so it’s sometimes nice to buy along the way too – and there’s no room for that if your packs are full. Tim and I both have Eagle Creek Switchbacks. They are backpacks that can also be rolled, in other words, my kind of backpack. They also have a day bag zipped onto the main bag. I have the 22, which when zipped into 2 pieces meets standard carry-on requirements. Tim’s clothes are a little bigger so he’ll be sporting the 25 and checking his (we need to put the liquids somewhere anyway). We bought these bags before going to Africa so they have been tested – and even though someone did try to break into them unsuccessfully they’re still in good shape. Have you ever noticed that no matter how organized your bag may look upon leaving your house, as soon as you open it the thing you need is at the bottom, and everything gets thrown out of the bag in the process of finding it? Well it happens to me all the time. 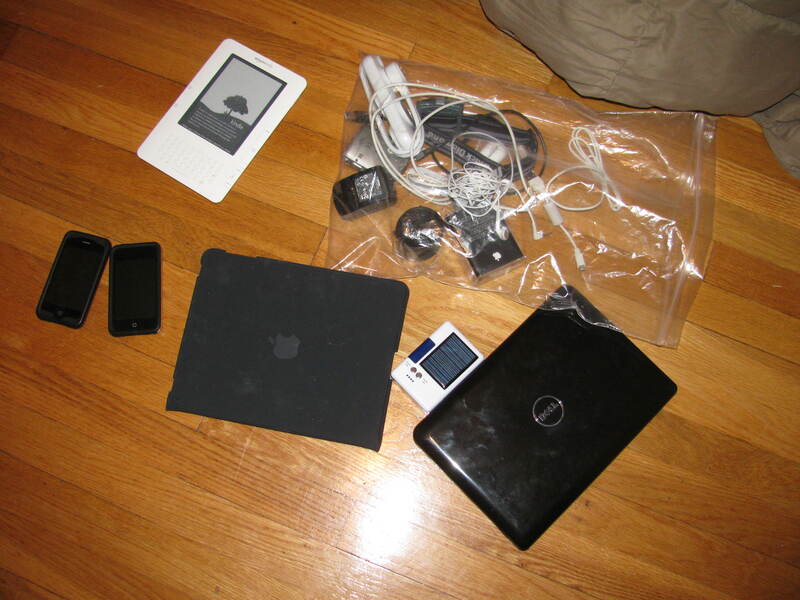 Tim and I also have packing cubes for our trip to help with this. Mine is double-sided, so I can turn one side into the hamper as we travel. A lot of the other things we’re bringing are bagged, stuffed, and compartmentalized. travel clock – relying on phones I’ve learned is a bad idea. This may seem like a long list compared to the bare essentials some travels take, but there’s a lot of benefits in traveling as a couple. We only need one of some things between the two of us which saves room. Also, we’re very comfortable with the amount of things we are carrying with us. We can run with our bags if need be (assuming my ankle works again soon) and we don’t travel with our packs completely full so we have room for new things. I’m actually really excited to live without my large closet of clothes for a few months. It’s a great reminder of how little we really need out stuff. So are there other things that we shouldn’t leave home without? Feel free to let us know. “What does a man need – really need? A few pounds of food each day, heat, shelter, six feet to lie down in – and some form of working activity that will yield a sense of accomplishment. That’s all – in the material sense. And we know it. But we are brainwashed by our economic system until we end up in a tomb beneath a pyramid of time payments, mortgages, preposterous gadgetry, playthings that divert our attention from the sheer idiocy of the charade. So… you’re packing a little black dress, but… Tim’s got… a hoodie? Maybe make him bring a tie? I made him bring a nice shirt, but he is rather attached to his hoodie. Seriously cannot wait to read all about your travels. You guys are so lucky you are able to do this and you’re going to have an incredible journey. I should have you pack my bag for my next marathon trip. I always bring too much stuff and forget something important. Have a great trip and stay safe! Can’t wait for the post about the budget journal. Tip of the cap to you, Mrs. Budget!! Thanks Sarah and Alicia. By the way. Sarah, the first comment comes from your next door neighbor – you guys should seriously say hi to each other! Hello! I could have sworn I’ve visited your blog before but after going through many of the articles I realized it’s new to me. Anyways, I’m definitely happy I found it and I’ll be bookmarking it and checking back regularly!